into the hills of Tehran. Suddenly he opens the window:“Look, this is prison for People with diploma.“ I turn around “you mean for intellectuals? Yes for artists, journalists, all bad people from university.“ Then he continues with a mischievous look: “This is prison for Kharrubi and Mousavi!“ I gasp for air. “And your President?“ Ali shifts gear, we ascend steeply. “My President is very good man, because he is very poor, not have Mercedes before, not have villa in center of City, he has poor background, he understands country people, they like him, he is kind, he takes money from rich people and gives to the poor. We have 30% poor people and 8% illiterates. He is good for the country! When Katami was President, he was nice man but done nothing for the poor. The cities are problem for my President, 70% in Tehran not like him, all cities are like that but cities are not the country! 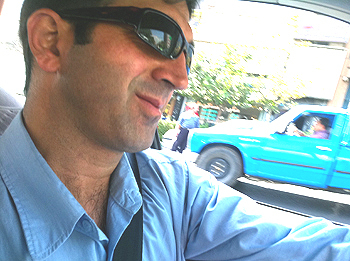 He keeps driving uphill to the cable car above Tehran. The cable car is only running on weekends (Thursday/Friday). We have a gorgeous view of the 14 mio. Megacity.